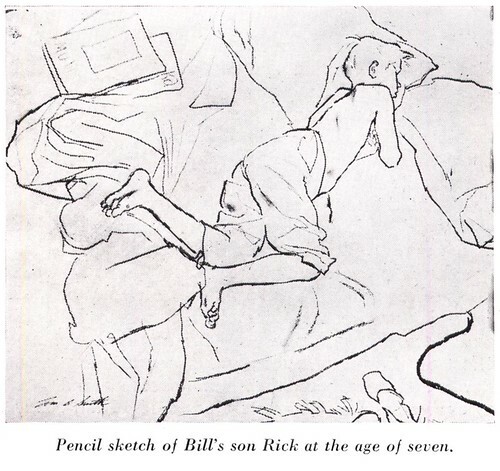 "The one-time popular presumption that the practice of illustration somehow disqualified an artist as a so-called fine arts painter seems by now to have been quite thoroughly dissipated." William A. Smith is held up as proof positive of this contention. 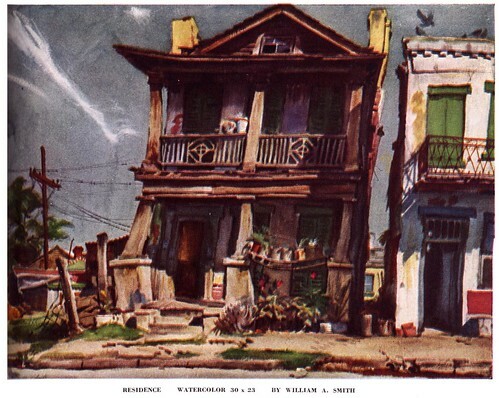 Smith, the article proclaims, "was an exhibiting painter before he got his first important illustration commission." I dunno, perhaps this debate will rage on for all time... so long as there are people who consider the artwork hanging on a gallery wall to be somehow more worthy than the artwork printed on the pages of a magazine. To my way of thinking quality is quality, and because the artwork has a utilitarian purpose (interpreting genre fiction, for instance) that doesn't reduce my appreciation for it as 'art' or disqualify the illustrator as an artist. When a subject... suggests a feeling that is provocative to me, I make very rapid pencil notes of it in a sketchbook. I study the sketch for a day or two, analyzing my reaction to the subject and doodling variations on the arrangement in an effort to eliminate factors that are extraneous and to develop those aspects that enhance the mood I wish to express." Smith says he takes pains to avoid "too much coping of details. I juggle elements, eliminating some, exaggerating others and inventing new ones." "A picture," says Smith, "should be a new entity rather than a replica of a bit of nature." Ladies and gentlemen, I give you... art! My William A. Smith Flickr set. WOw...today's image just read real strong to me. At first I thought it was a guy defending himself, then I saw that he was shooting a cop and holding that kid. 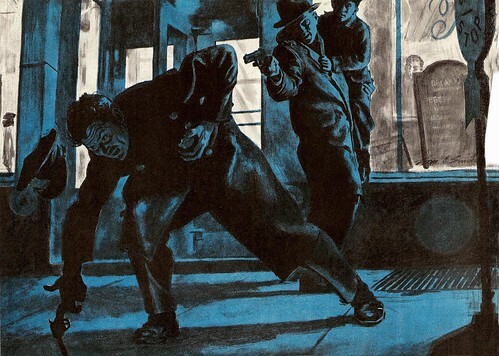 Made me think of "Road to Perdition"
Nice overview of the artist. This is the question I've been thinking about on and off for a very long time. I figure Art at its max is when the actual artist produces not only something extraordinary in quality but also when he or she points out in a different direction no one ever dared to go before. Once I've said that, I couldn't care less if something is "art" or "not" as long as it grabs me and takes me into a world I experience of mine. If I can feel this sort of connection I just -don't care- about the rest. Thanks for your blog, actually I just discovered it. Now that is a provocative bit of communication. I'm going to play devil's advocate here: If you create a picture that is 'a replica of a bit of nature', aren't you by definition creating something new? Even photo realism is an interpretation. And therefore a new entity. None of which means to disparage Smith or his talent, which is so obviously a result of his rigorous training & dedication. Great post on an incredible illustrator. I used to work with his daughter and informed her of these postings. Thanks, Leif, for bringing some attention to an incredible talent whose work has not been seen by many of the younger generation. I'd love to see more on Mr. Smith in the future. Kim Smith, Bill Smith's daughter here. The members of my family are thrilled to find the Dad's work on these pages, and to read the comments. 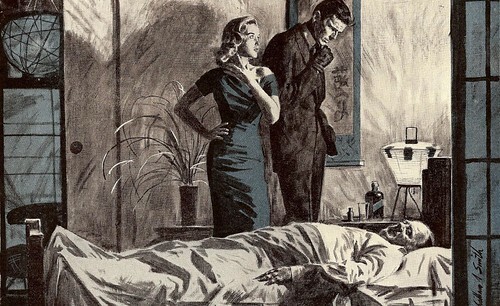 The illustration at the top of the April 1 blog is an illustration from "The Big Heat", and hangs above me as I write. Many family members and close friends posed for this illustration at New York's "Leon and Eddies". My brother, who was 12 or 13 at the time, remembers dancing with someone on the dance floor to while away the time. We in my family would be very happy to communicate and trade resources with readers about Dad's work.